Written by Indicate Capital on March 18, 2019 . Posted in Uncategorized. INTERESTED IN DEVELOPING A REAL ESTATE INVESTMENT PORTFOLIO IN COLORADO? HERE’S HOW! Written by Indicate Capital on March 11, 2019 . Posted in Uncategorized. Many people consider developing a real estate portfolio as a full or part-time source of income. Real estate in Colorado has attracted investors from all over the country. Real estate investment options are waiting all over this great state. No matter which city you choose to focus on, there are some key considerations to keep in mind. When you follow these five points, you’ll find it that much easier to achieve your Colorado real estate income goals. Upfront and ongoing expenses will be a major factor for you each time you add a new element to your real estate investment strategy. It may take time (weeks or even months) to nurture a property to the point where it efficiently adds to your bottom line. So, make sure your current cash flow meets the new requirements. Speculation is normal in real estate investing. Leveraging debt is an efficient way to take advantage of solid opportunities. That said, a positive cash flow is a crucial element of overall fiscal security. If you are looking at using a hard money loan, make sure you find favorable rates from a private money lender. But before finalizing your loan make sure to read the fine print. For example, are there pre-payment penalties, hidden fees, credit checks, etc.. Managing a real estate investment portfolio can quickly develop into full-time work. The skills and interests necessary to steer a portfolio long-term are different from those needed to select a property initially or to renovate it. A management group can help you with the process. One way to weather changes in the market is to have a diverse portfolio. In Colorado, a portfolio that incorporates both commercial and residential properties is especially useful for most real estate investors. Diversification mitigates risk, which means lows aren’t quite so low and highs can still be very high. When you decide to buy an investment property in Colorado, there are many steps you can take to protect your interests: Reviewing boundary lines, inspections, thorough underwriting, etc. Still, the unexpected can happen so be sure you have sufficient funds ready to help in the event a new investment property has any surprises. Successful real estate investments start with the right funding package. 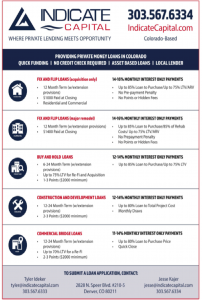 Indicate Capital has helped investors to begin and/or grow their Colorado real estate portfolios with a wide range of loan options. We make the process simple so you can move forward on your goals quickly. Indicate Capital is a reliable name that works with real estate investors of all types. Written by Indicate Capital on February 13, 2019 . Posted in Uncategorized. If you are looking to buy a real estate investment property in Colorado you may be looking to close on a deal quickly, and you don’t need a 30-year loan for an easy 3-6-month flip & flip. By choosing to work with a private money lender you are given a bit more flexibility to work with. But, just like any other loan process, it is still possible to make mistakes. The details of every private money loan will depend on the investor buy typically the lending terms will fall within these terms; 1-3 year notes, up to 75% LTC, 0%-3% origination fees and interest only (monthly) payments. Having large goals are great to shoot for, but having realistic goals is even better. We want to see you achieve goals and not just claim you can do everything and more. When discussing with your lender be specific about what your goals are. Have the figures and information prepared to be reviewed thoroughly. We know most investors like to support their local community buy shopping locally or donating to local charities. You can do the same with your private money lender in Colorado and you’ll also get the experience of someone who is invested in seeing the community you are working in thrive. Yes, private money lenders are going to move faster than a traditional lender, but by being overly pushy and checking in too frequently or too aggressively you may be distracting the lender from getting the loan completed. Typically, the lender should be the one following up with you letting you know where your loan is at in the process. So, take a breath, and trust that we know how time sensitive the deal is. One last tip to keep in mind: private money lending in Colorado has different rules. No matter where the lending is coming from there are regulations and rules associated with it, and if you’re working with a private money lender in Colorado, they may also have other rules to follow so make sure you know them. For more information on private money lending in Colorado or if you are interested in buying an investment property in Colorado, contact Indicate Capital. Written by Indicate Capital on February 7, 2019 . Posted in Uncategorized. If done the right way, investing in commercial properties can yield significant benefits. Working with reputable commercial hard money lenders in Colorado, like Indicate Capital can help you secure the funds you need. Types of commercial properties include apartment complexes, office buildings, warehouses, retail spaces, or industrial buildings. Some properties may include several types of uses. Investing in properties like these can potentially result in a high return. Any landlord knows that investing in property is far more complicated than just sitting back and collecting the rent. Although, most times, commercial tenants tend to be easier to work with than residential ones. For starters, the law allows far greater flexibility in drafting a commercial lease than a residential one. You have latitude in choosing the type of lease and essential terms such as lease termination, security deposits, notice periods, and any other matters of importance. Further, working with a business generally creates a more professional relationship. Businesses generally have at least the same level of investment as you do in keeping the property in excellent condition and building good relationships with neighbors. As a commercial property owner, you may be able to use a lease that shifts most of the property’s expenses to the tenant, known as a triple-net lease. This can save you both money and hassle, as the tenant takes care of maintenance and other issues. While specific rental income depends on numerous factors such as the location, property type, and the specific business that rents from you, returns on commercial investment properties typically exceed those on residential rentals by a substantial percentage. A potential investor can usually assess the value of a commercial property based on specific, objective facts. These consist of the income the current landlord receives from the property, which is an easily verifiable fact. In contrast, residential properties are often valued based on an assortment of different perceptions, which can be hard to unravel. The value of any investment asset can rise or fall due to factors out of the investor’s control. While this can be true of commercial properties as well, you can also take action to minimize risks and to increase value. 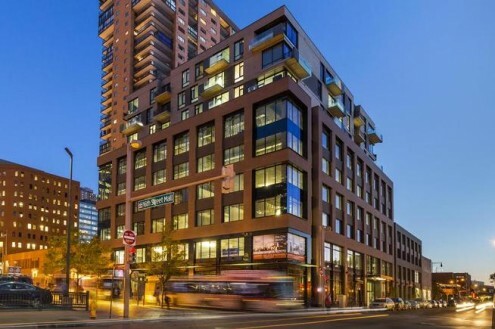 Raising the rent, improving the buildings, and obtaining the necessary permissions to add or change a property use are some common ways landlords can add value to commercial real estate. If you need help getting commercial real estate financing for your investment, Indicate Capital commercial property loans can provide what you need. Reach out to us online and let us know how we can help. Written by Indicate Capital on January 31, 2019 . Posted in Uncategorized. There has been a lot of talk, discussion and speculation on the current status and direction the real estate market is taking right now. We saw things slow down quite a bit during the month of November 2018. In December, things picked up a bit, and during January 2019 we have seen quite a bit of loan opportunities. As Denver’s premier lending company, our team at Indicate Capital works very hard to stay alert and aware of the market. At this point we believe one thing is certain – there is a not a lot of clarity as to how 2019 will look, and, most likely, it will be a flatter year than previous years. 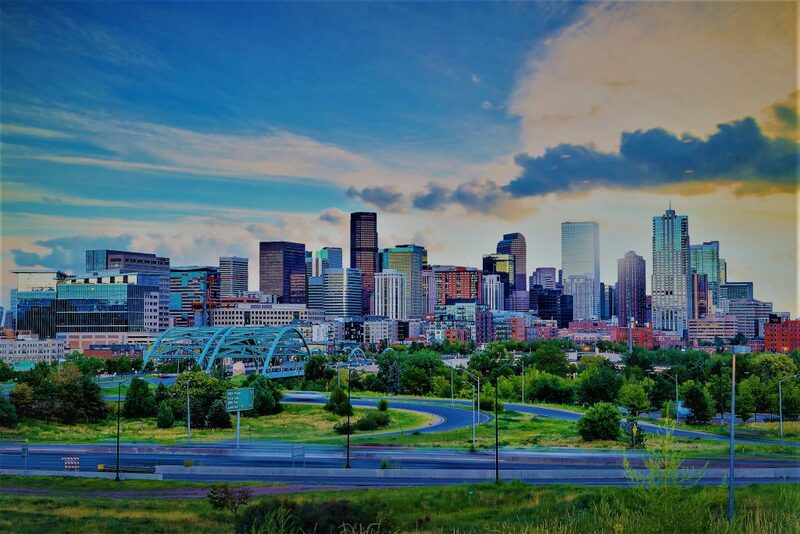 The Denver area has had nearly seven years of very rapid growth and expansion. 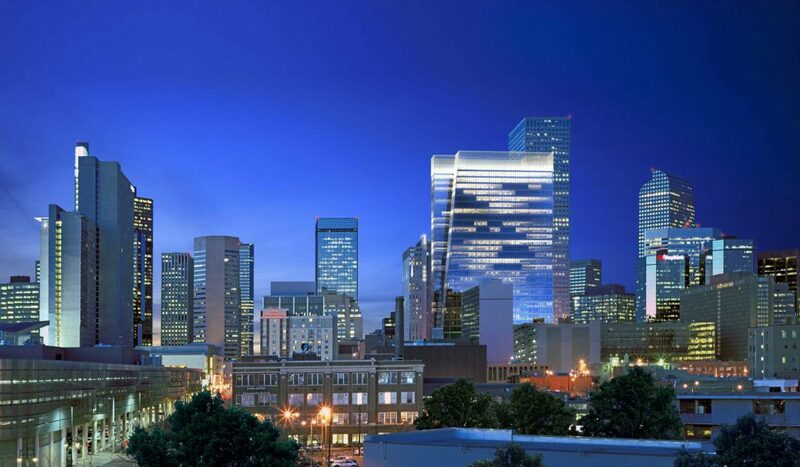 There are many factors driving the growth Denver has experienced for so long. We have seen a very strong population expansion, which has driven much of the demand for housing. Seven Years ago, on a national level, Denver homes were relatively affordable – and even cheap in some cases. Today, the picture looks much different than it did coming out of the Great Recession. Denver has become a top-tier market, meaning it is attracting jobs, large companies, and therefore more investment from institutions. This has driven the development of new apartments throughout the urban core and much of the housing development in the surrounding area. The main issue facing the Denver metro market is affordability. Wage growth has not kept pace with the cost of housing. All of this coupled with the political landscape both federally and at the state level ranging from the federal government shutdown, the Fed raising interest rates, and other trade issues have all caused for increased uncertainty in the market in general. We expect to see the Denver real estate market moving towards a more “normalized” market. We do not plan to see the same value appreciation that we have experienced over the last few years. Construction costs continue to be so high that new development projects are very difficult to make “pencil”. This holds true in both the commercial and residential space. 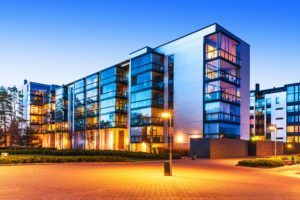 Both asset categories have seen a very strong market over the past seven years, and rental rates have grown dramatically across the board. We expect this growth to slow over the next year. Indicate Capital expects there to be very strong demand for private bridge loans as banks continue to become and more tentative in their lending. Additionally, banks have been primarily lending on real estate during this boom period, and their balance sheets are “full” in that asset category per their regulator guidelines. At Indicate Capital, we also look at alternative uses or sources of cash flow from the investment real estate assets we lend on. This could include different tenant types in the commercial spaces, and rental income on projects intended for resale. Overall, the market will eventually move into some sort of normalized pace and there may be a bit of a slower sales cycle for the homes and projects Indicate Capital lends on. We do not have a “doomsday” outlook on the Denver real estate market.